I think Harry Callahan said it best: a man’s got to know his limitations. Loathe as we may be to admit it, we all have limitations. Our bodies can only go so long without food, water, and sleep. The mind can only process so quickly, the memory retain so much, the senses absorb so much input before they cease to function properly. But let’s be honest: some of these limitations might get exceeded on occasion without major catastrophe. 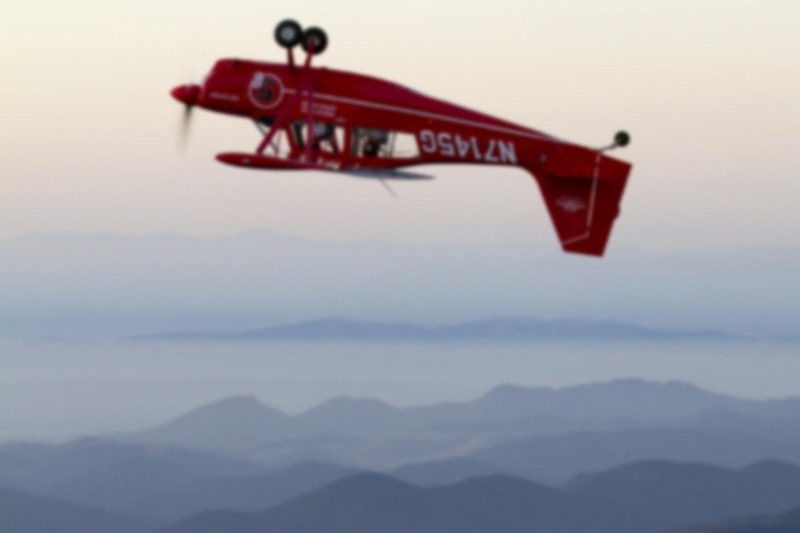 Perhaps it’s a slight overspeed on a fixed pitch prop during aerobatics. Flying a bit over gross weight. Exceeding a duty day limit. Extending the flaps a few knots above Vfe. Flying under VFR when the visibility hasn’t quite reached the requisite level. Normally, these minor variances don’t result in scratched paint. The problem is, once you’ve exceeded the limitations, you’re essentially a test pilot and the margin of safety built into the aircraft by the designer is now gone. How far can you push it before something bad happens? Nobody knows until it actually happens. I hope you’re as uncomfortable thinking about that as I am writing it. Jet aircraft, with their 200+ mph takeoff speeds and higher weights, can place tremendous strain on the brakes in the event of an aborted takeoff. That’s why most aircraft in that class have a time limitation after an abort. The brakes must be allowed to cool for a specified period (or, if the aircraft has brake temperature sensors, until a specific temperature is reached) so that if the second takeoff attempt also ends with an abort, the brakes don’t overheat and fail. I feel for the flight crew. If brake limitations exists and the flight crew intentionally exceeded them, FAA sanctions will be difficult if not impossible to avoid. Aviation is like that. You can fly safely for 20 years and with one moment of carelessness ruin a whole career. Tough business, eh? 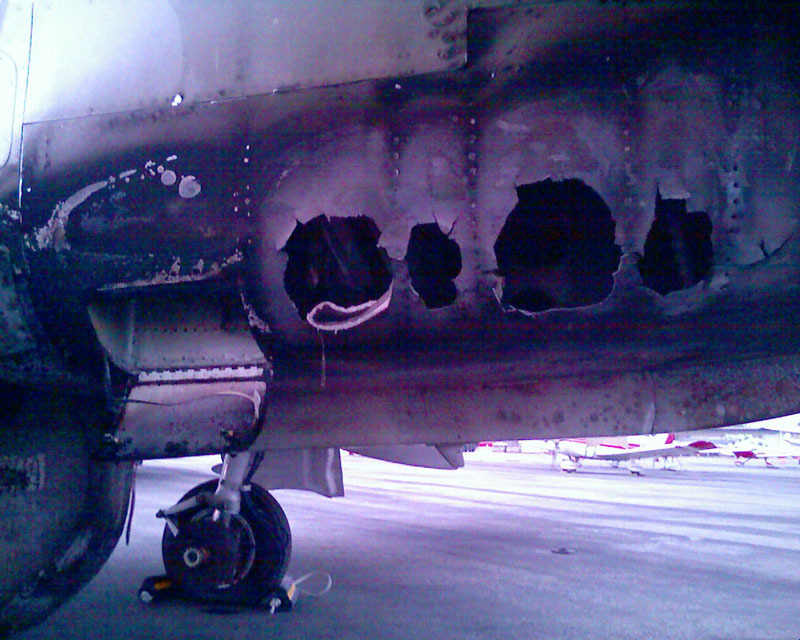 On the other hand, limitations don’t necessarily mean an aircraft can’t take a tremendous amount of abuse! To wit, you might be interested in this video of a brake certification test on the Boeing 777. Known as a “maximum rejected takeoff” test, the purpose is to ensure the aircraft can be stopped if a takeoff must be aborted at the worst possible moment under the worse possible conditions. To simulate that situation, regulations state that the aircraft must, at max gross weight (660,000 lbs! ), be able to accelerate to decision speed (around 210 mph) and then stop using nothing but extremely hard braking. No flaps, no spoilers, no thrust reversers. Oh, did I mention that the brake pads must be worn down to minimum before the test starts? They must then absorb nearly ten million foot-pounds of energy in about 20 seconds without catching fire. I’ve seen this video clip a hundred times, but it still amazes me every time I watch it. Enjoy. I find it interesting that only the in board tires on the main trucks blew out…have you heard anything as to why that is? Ah. I should have explained that. Both tires on the left side were lost, as that was the side where the hydraulic lines failed. 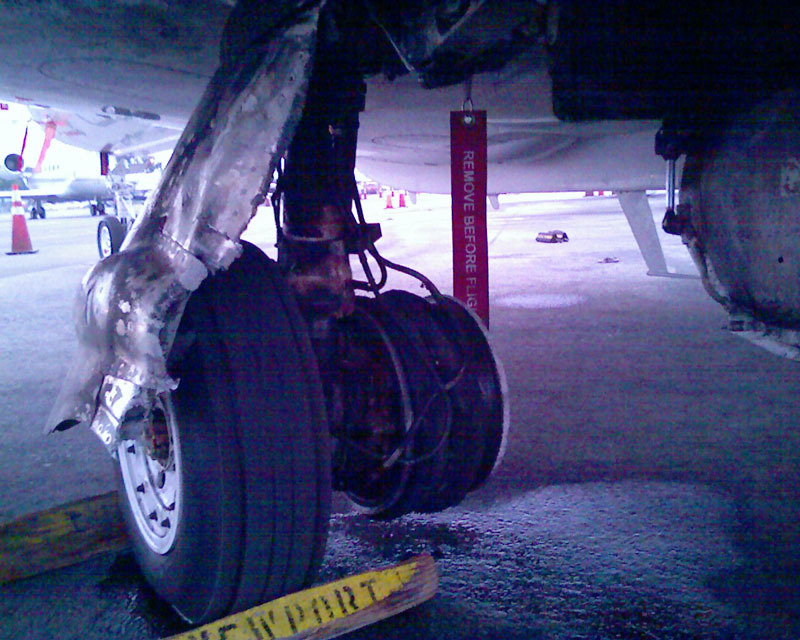 They two tires on the right side were untouched, so the maintenance guys simply moved one of the right tires onto the left main landing gear so they could tow it off the runway. Hope they remember to “Remove before flight!” Wow, that FLUF is totally jacked now. Glad everyone’s OK (despite the inquisition). I think GA pilots/students should keep that braking risk in mind during their own practice, too. Luckily at my home base on weekends, there’s almost always a 20 minute wait for takeoffs. Wow that is really cool I just watched it again and wow that is amazing. 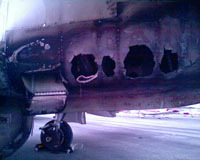 I find it a little interesting that the didnt cath fire ’till the plane stopped. probably because there is no wind blowing it out or something like that I dont know . Anyway thought that was pretty cool,I dont know about you. Ron please contact me at 424 207 9419 I am interested in viewing the video of the aircraft n800cc incident in santa anna airport. thank you. Great article. I got to see the heat levels when I went out to meet a King Air that had a left brake stuck partially applied on takeoff. If I remember right they accelerated to about 60 knots, realized there was a brake problem and aborted. When I arrived I felt the heat, saw the paint on the brake assembly change color and then watched the disk crack as it cooled. Obviously this was worse than a normal abort since it was partially applied during acceleration but was a great lesson for me. Reminds me of a dragging brake I had in an SR20. The student, a CFI getting checked out in the Cirrus, was taxiing the aircraft for the first time. I might have picked up on the brake issue, but he didn’t know what “normal” felt like in a free-castoring Cirrus. Just the slow taxi from south parking to runway 19L at SNA was enough for it to catch fire and we had to put it out with the onboard fire extinguisher. Turns out the problem was a fractured brake pad which was constantly in contact with the rotor. The more I thought about it, the worse it seemed. Brake lines are filled with flammable fluid. The fairing is fiberglass and will burn. And right above that is the wing and internal fuel tank. Shortly after that, Cirrus came out with brake overheat indicators, and eventually, the brake temperature monitor on the MFD in the G3 models.